Chalkboard graphics are all the rage online at the moment and this tutorial will show you some tips that you can use if you want to create your own. This is a great technique for adding graphics to blog posts, particularly for crafts subjects. For the purposes of this tutorial, there are some fonts and assets you may want to use. The two fonts are Eraser Regular and Seaside Resort and the chalkboard backgrounds have come from Foolishfire. These free versions of the backgrounds have been designed for use online, but they also offer a hi-res version that you can purchase if you are producing a graphic for print. The chalkboard background set contains three different options that you can use, so you can select your favorite from a gray, blue or green background. Go to File > Open and navigate to where your selected background was saved. Chalkboards used for display commonly have painted elements on them, so the first thing we're adding to ours is a simple frame. Go to File > Place and select the frame PNG by clicking the Place button to import it into the background file. 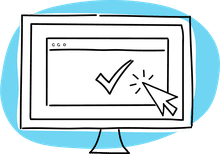 You may need to resize the frame by clicking and dragging one of the eight drag handles around the outer edges, before hitting the Return key or double clicking on the frame. This first piece of text is also meant to be painted. So, it doesn't have the roughness of chalk. The example uses the Seaside Resort font for this as it has a nice feel that is in keeping with chalkboards and because its designer has licensed the font for use in personal and commercial projects. Now, click on the Text tool in the toolbox and then click on the chalkboard at about the halfway point near the top. In the tool options bar that is located below the menu bar, you should click on the button to center align the text. If the Character Palette isn't open, go to Window > Character and then select the font that you want to use from the drop down menu. You can now type in your text and use the size input box to adjust it to fit. If necessary, switch to the move tool and drag the text into position if it's not quite right. When you're happy with this text, move on to adding some chalk writing in the next step. When you've added some chalky text to your design, then move on and look at how you can add images that have a chalky feel. In the real world, chalkboards rarely have detailed images on them, but we're not in the real world right now. So, let's look at how we can add photos that have a bit of a chalky appearance. First, you'll need to select an image to use. Ideally find something with a simple subject (the example uses a self-portrait) that doesn't include a lot of intricate detail. Open your photo and if it is in color, go to Image > Mode > Grayscale to desaturate it. This technique works best with images that have strong contrast, so you may want to tweak it a little. An easy way to do this is to go to Image > Adjustments > Brightness/Contrast and increase both sliders. For the next step, go to Image > Mode > Bitmap and set Output to 72 DPI. In the Method set Use to 50% Threshold. If you don't like the way the image looks, you can go to Edit > Undo and try tweaking the brightness and contrast. Then, try converting to a bitmap again. It is possible that some images will never convert as well as you like using this method, so be prepared to select a different image if that is the case. Assuming that the bitmap conversion has gone ok, you should go to Image > Mode > Grayscale, leaving the Size Ratio set to one, before you can continue to the next step. 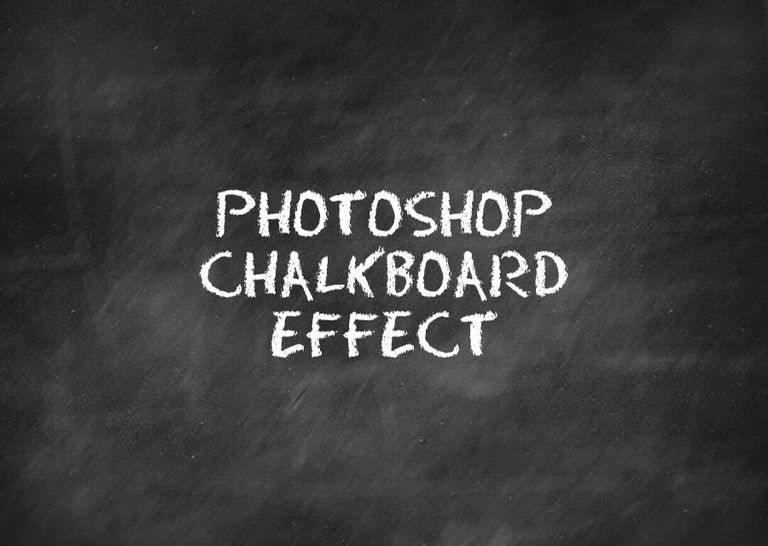 To add your image to the chalkboard, click on it and drag it onto the chalkboard window. If you have Photoshop set up to open your files in a single window, just right click on the tab of the image and select Move to New Window. You can then drag it across as described. If the image is too large, go to Edit > Transform > Scale and then use the grab handles to reduce the size of the image as required. You can hold down the Shift key while dragging to keep the image proportions unchanged. Double click the image or hit the Return key when the size is correct. In this last step, the key is to make the image look a more as if it has been drawn on a chalkboard. The first problem with the image is that the black areas don't match the chalkboard itself, so you'll need to hide these areas. Select the Magic Wand tool (the fourth tool down in the toolbox) and click on a white area of the image. Then go to Layer > Layer Mask > Reveal Selection and you should see that the black areas disappear from view. In the Layers palette, there will now be two icons on the image layer. Click on the left hand icon and then change the Blending Mode drop down menu at the top of the Layers palette from Normal to Overlay. You'll see that the texture of the chalkboard now shows through the image making it look more natural. In this case, it also made it a little pale, so if that happens, go to Layer > Duplicate Layer to add a copy on top which made the white a bit richer. This still keeps the chalkboard texture visible. That's all there is to this technique and you can easily adapt it by using different fonts and also other decorative elements, like frames and swatches.